As a Patriots fan, it has been a grueling two weeks since that awful Sunday. The scab is gradually transforming into a scar, just like the other wounds created by the New York Giants. Nevertheless, it is time for some NFL awards. Although The NFL Honors have already occurred, here are four of my own for the 2017-2018 NFL season. This award physically pains me to write. Tom Brady is a mentor, a father figure, an immortal being, and, above all, a symbol of hope. 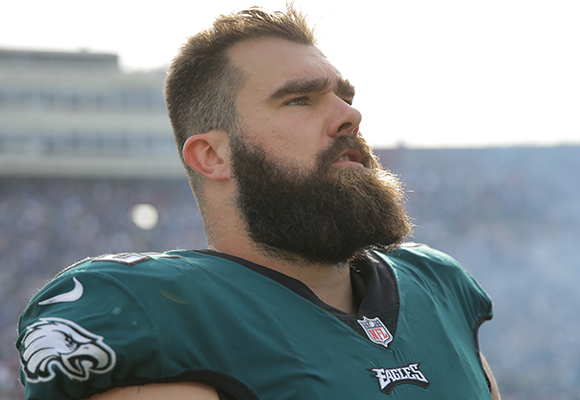 Jason Kelce is not a household name like Tom Brady is. However, the world must know who he is and why he was the most valuable player this season. He’s the Eagles’ center and is one of the most athletic, smart, and well rounded players in all of football. Even though he can’t run a 4.2 40-yard dash, his athletic ability at center is unparalleled. He gave Nick Foles and Carson Wentz the protection they needed to allow plays to develop downfield and to get to the second level quickly to help Jay Ajayi and LeGarrette Blount pound the ball. The Vikings, the number-one-rated defensive team in the NFL, didn’t put much pressure on Foles; the Patriots didn’t even register a sack. For Bill Belichick ’75 , the Vince Lombardi of his era, not to make second-half adjustments to sack Foles is mind boggling. Much of that success can be credited to Kelce. The center is the leader of the offensive line, calling out linebackers and blitzes. The Eagles offensive line was almost impenetrable during the season. That’s what makes great teams: a stellar offensive line. Think about this statement for one second: The Jacksonville Jaguars walked into New England and almost advanced to the Super Bowl, with Blake Bortles as quarterback. I love Bortles as a man—much due to his Barstool interview, which was a hoot—but there’s no way he could’ve advanced to the AFC Championship game alone. The Jacksonville Jaguars defense reminds me of the Ravens defense that beat the 49ers. There is no level of their defense that’s weak. Calais Campbell and Marcell Dareus lead the line, Telvin Smith and Myles Jack hold down the linebacker core, and A.J. Bouye and Jalen Ramsey run the secondary. All those players could be All-Pros in the coming years, especially the linebackers and defensive backs. The Jags played hard even while no one ever believed that Jacksonville could succeed in the postseason. Well, they did. Ramsey made the decisive interception against the Bills in the Wild Card game. Smith picked off Big Ben and took it to the house against the Steelers, and Jack had the most incredible strip and recovery of Dion Lewis in the AFC Championship. The Jags proved that they deserve to be in the conversation of the NFL’s elites. Whether they actually go all the way next year is to be determined; however, they will be in it for the long haul. The Falcons were supposed to come back this year with a chip on their shoulder. The Patriots overcame a 25-point deficit to take away Atlanta’s first Super Bowl. The defense struggled at times during the year, but it was the offense’s failure that was the most perplexing. How could a team headlined by Matt Ryan, Julio Jones, and Devonta Freeman not play well offensively? The offensive line wasn’t great at times, which decreased how much Ryan and Jones could connect. The most important reason for the Falcons’ failure is that they started so slow during the beginning of the season that they could never recover. They almost beat the eventual Super Bowl champions in Philadelphia but came up just short. They were supposed to come back this year and win, but Dan Quinn and Matt Ryan failed to put the 25-3 jokes past them. As a result, they didn’t even advance past the Eagles in the Divisional Round. There’s no way around this: Doug Pederson is the coach of the year. Having your franchise quarterback tear his ACL in the middle of a Super Bowl run is devastating. Most teams would fold in this situation, but Pederson didn’t let that happen. The Eagles not only adjusted to life without Wentz, but they also evolved in a positive way. Foles stepped in and played out of his mind. Even though much of that is attributed to Foles himself, you can’t overlook Pederson. Furthermore, Pederson made key play calls that made the Eagles Super Bowl Champions. Not many coaches have the gall to go for it on fourth down against the Patriots in the Super Bowl; not many coaches aren’t intimidated when facing the Patriots. Pederson put a team on the field that had no fear. They went out there and soared. Without Pederson, I don’t think the Eagles could have overcome the Wentz injury.